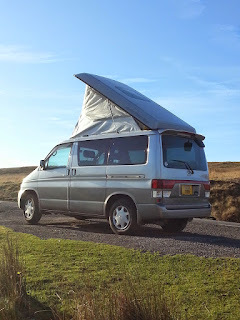 Hiring a Mazda Bongo campervan from GoBongo is the coolest way to enjoy unspoilt beaches, scenic mountain views, or just escape to the peace and quiet of the countryside. We want you to experience those magical moments that turn an all too brief holiday or weekend break into special memories that will last a lifetime. Whether it's waking to the sound of breaking waves, watching the sun sink below a distant horizon, or sitting by a campfire and gazing at the crystal night sky, you will find what you are looking for in Wales, together with over a thousand kilometers of coastline and three beautiful National Parks for you to explore. Trellyn Woodland, Pembrokeshire offers glorious isolation with only 5 camping pitches set in 16 acres of beautiful countryside. Each pitch has its own campfire and outdoor cooking station. Only accepts full week bookings due to high demand. Carfai Bay is a cliff-top site with sea views and easy access to St Davids and the beautiful Pembrokeshire coast. Choose from two sites with good facilities at Carfai Bay and Carfai Farm. Hillend at the tip of the Gower peninsula is a surfers paradise sitting just behind the dunes of Rhossili bay. Only electric hook-ups available, but good facilities and a short walk up to Llangennith village. Three Cliffs Bay on the Gower can be exposed in high winds but offers some pitches with cliff-top views over one of the best beaches in Wales. Often fully booked but nearby Nicholaston Farm also has great views and is highly recommended. Cae Du (Rhoslefain) is a part sloping site on the Snowdonia Coast with panoramic sea views. Well maintained facilities and easy access to the Snowdonia National Park also help to make this a perfect site to get away from it all. Graig Wen is an award winning site with unforgettable views out over the Mawddach Estuary at sunset. Perfect for cycling or walking in Snowdonia. Close to Cader Idris and has excellent facilities. Shell Island is a unique seaside campsite accessed over a tidal causeway and spread over 330 acres. A big site which can be very busy in peak season, but a great location close to Harlech Castle and the Snowdonia National Park. Aberafon is an isolated spot on the north coast of the beautiful Llyn Peninsula. With scenic pitches right by the shore, mountains, a stream, and the chance to watch sunset from a beach campfire. Pencelli Castle is an award winning site in beautiful countryside close to the centre of the Brecon Beacons. Top facilities and quiet location make this an ideal base for walking or cycling holidays. Rhandirmwyn is a well kept site for those who want peace and seclusion where even your mobile phone can't distract you from the scenic views. Great for country walks or cycling. Tyllwyd is hidden away on the banks of a stream in the glorious isolation of mid-Wales. Great reviews despite midges at dawn and dusk. Close to the beautiful Elan Valley and Devil's Bridge. For more ideas go to the Cool Camping website or visit the map on our “Where to Go” page.